Today again, we’ll be focusing on the characteristics and benefits of two luxury hybrid beds, the DreamCloud Sleep mattress and the Leesa Hybrid (Sapira). Hopefully this review may help you choose the one that will best meet your specific needs and preferences. The DreamCloud Sleep is a 15″ pocketed coil, foam and latex hybrid composed of 8 layers. 2″ Top Comfort Layer – This layer is 2″ of soft Cashmere top cover that features hand tufting and provides comfort and sumptuousness to the mattress. .5″ Cooling Layer – This layer is .5″ of Gel Infused Memory Foam that provides cooling to the top layers of the mattress. 1.75″ Comfort Layer – This layer is made of 1.75″ of soft quilted memory foam designed to provide pressure relief and comfort. .5″ Response Layer – This layer is .5″ of natural hypoallergenic latex that provides bounce and contour. .25″ Support Layer – This layer is .25″ of DreamPlush supportive memory foam inserted for additional body contour. .5″ Transition Layer – This layer is .5″ of DreamPlush high-density supportive memory foam that makes a transition layer between the upper comfort layers and the lower coil support layer. 8″ Support Layer – This layer is 7″ of high-quality steel pocketed innerspring coils with a 5-zone layer of varying stiffness designed to provide exceptional support to the body in the areas where it is needed most. 1.5″ Base Foundation Layer – This layer is a final 1.5″ of high density super soft memory foam that serves as the lower foundation layer of the mattress and creates deep compression support. The cover of this mattress, as it has been already mentioned, is made of breathable, super soft, double tufted Cashmere that adds to the luxury feel of the mattress, and that is to be found only on super premium mattresses costing upwards of $5-6000. The DreamCloud Sleep hybrid mattress only comes in one firmness option which scores 6.5 out of 10, with 10 being the firmest. The multiple layers of which it is comprised make it suitable for sleepers of different weights. Heavier sleepers will not press through the top comfort layers and feel the support layers beneath; they will feel the soft plush top comfort layers while at the same time their bodies will be supported by the pocketed coil layers. This mattress also provides enough give in the top comfort layer to cradle your body when sleeping on your side, and it has firmness needed to support your back and stomach. The top memory foam and latex comfort layers provide excellent body contour and give you a feeling of hug specific to memory foam. As for the comfort, the DreamCloud is the most comfortable hybrid mattress that we have tested to date. The mattress is 15 inches thick with 8 different layers incorporated within it, out of which the gel-infused foam top layer prevents heat retention and helps in cooling your body, while the top comfort foam layers with the soft hand-tufted Cashmere cover provide good body contour and an overall feeling of luxury and comfort. The hybrid construction of this mattress and the layer of latex in the top comfort layers provide the expected degree of bounce to the mattress. The DreamCloud Sleep provides a lot of comfort while offering enough support to the body where it is needed most, which makes this mattress perfect for all sleeping positions. The DreamCloud Sleep does a good job in reducing heat and keeping you cool due to the gel infused top foam layer and the innerspring layer that allows excellent air circulation. The latex layer and the cashmere top cover contribute to this and ensure that this mattress sleeps cooler than most mattresses we have tested. 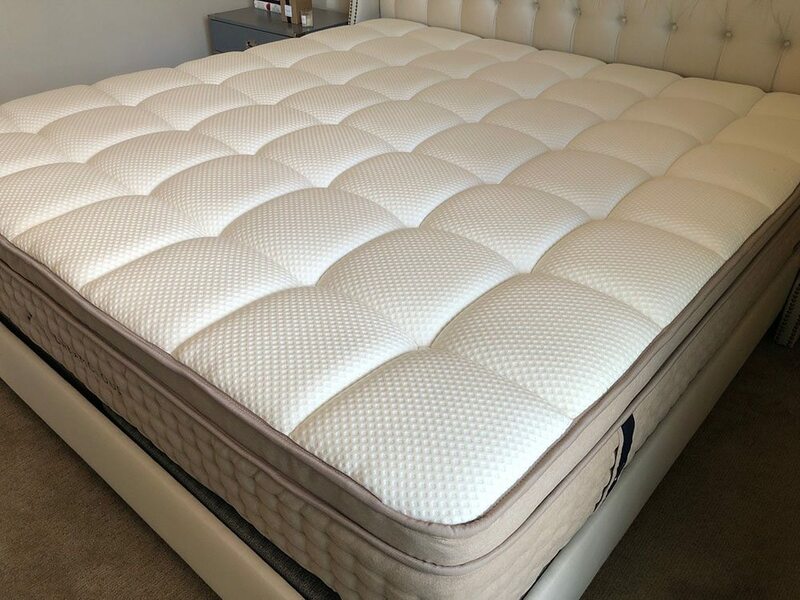 This hybrid mattress does an excellent job with sinkage too as its 15″ thick construction along with the premium layers of foam and high-quality innerspring coil layer prevent sinkage in the least bit, even with heavy sleepers like my partner Andrew (230lbs). Edge support is pretty noticeable on this mattress due to the use of the reinforced edge layer in the mattress construction. Although the initial foam layers do compress at the top, there is no feeling of sliding off the edge of the bed. When it comes to motion transfer, individually pocketed coils within this mattress that help with distribution of weight across the bed also cause a certain degree of motion transfer that is expected with a hybrid coil mattress that provides more bounce than a foam or latex mattress. However, the multiple foam layers used in its construction limit excessive movement. DreamCloud Sleep mattress also gets high marks in this category for not having a noticeable smell upon opening the box. The hybrid construction of it minimizes the degree of off-gassing typical for all foam mattresses. The Dream Cloud Sleep mattress is very reasonably priced coming in at $1399 for a Queen (you can save $200 by clicking here). This is totally unexpected given the luxury of this mattress, its hand tufted cashmere, and other highest quality materials used in its construction. Click here to read the full DreamCloud mattress review. The Leesa Hybrid (Sapira) mattress is an 11″ pocketed coil and foam hybrid made up of 5 layers. 1.5″ Comfort & Cooling Layer – This layer is 1.5″ of high-density performance foam that serves to provide an initial response to the sleeper and improve airflow. 1.5″ Contour Layer – This is a 1.5″ memory foam layer beneath the top performance layer that provides body contouring and pressure relief during sleep. 1″ Transition Layer – This layer is 1″ of poly foam which provides support and serves as the transition between the memory foam layer and pocketed coils. 6″ Support Layer – This layer is 6″ of pocketed coils (1,041 in a Queen mattress) which provide the main support for the mattress. They feature pressure zones that provide support where it is needed most, while edge support coils provide exceptional edge support for the Leesa Hybrid. 1″ Foundation Layer – This layer is 1″ of poly base foam which serves as the support for the layers above it. The cover of the Leesa Hybrid (Sapira) mattress is made up of a soft and comfortable blend of poly and lycra. It has a visually appealing and soft 4 bar pattern and assists with airflow and breathability. The Leesa Hybrid (Sapira) mattress comes in only one firmness option just like the DreamCloud Sleep and scores 7 out of 10 on the firmness scale, with 10 being the firmest. The combination of pocketed coil foundation and the top comfort layers provides excellent support to heavier sleepers without making them feel like they are sinking into the mattress. It provides enough give in the top comfort layer to support shoulders and hips and has the firmness necessary for back and stomach sleeping. Therefore, it is suitable for all sleeping positions. The Leesa Hybrid (Sapira) mattress is quite comfortable with the expected degree of bounce needed to switch positions during the night and support body weight, and different foam layers in the top comfort layer that provide good body contour and hug. The soft exterior cover combined with the multiple layers of foam does a good job at providing response and body contour without the feeling of being trapped in foam. Just like the DreamCloud, the Leesa Hybrid (Sapira) mattress does a good job at sleeping cool due to the combination of the innerspring pocketed coils and multiple foam layers in the top comfort layer. Memory foam often leads to the build-up of heat, but this is not the case with the Leesa Hybrid (Sapira). It helps you stay cool during the night without causing the sweaty and sticky feel typical for memory foam mattresses. The pocketed coil construction of the Leesa Hybrid (Sapira) does an excellent job at supporting heavier sleepers like Andrew (230lbs) and causes a minimal degree of sinkage. Edge support is also very good with this mattress as edges do not compress when sitting or lying near them. As for the motion transfer, it is a little bit higher than in most memory foam mattresses we have reviewed, but it is to be expected with the hybrid construction of this mattress which naturally provides more bounce than the full foam or latex mattresses due to the innerspring coils in its construction. The Leesa Hybrid (Sapira) gets high marks in this category for not having a noticeable smell upon opening the box. Its hybrid construction minimizes the degree of off-gassing typical for memory foam mattresses. White glove delivery and installation option, for $99 a two-person team will set up your mattress in your house. The Leesa Hybrid (Sapira) is reasonably priced, coming in at $1695 for a Queen. This is a good price given the quality materials and construction used in this mattress. Click here to read the full Leesa Hybrid (Sapira) mattress review. Below is our comprehensive side-by-side comparison of the DreamCloud Sleep vs. Leesa Hybrid (Sapira) mattress. Sleeping on your back and stomach – The combination of pressure-relieving foam and supportive wrapped coils makes this mattress perfect for back and stomach sleepers. A luxury feel at a reasonable price – The use of plush memory foam, hand tufted Cashmere and other highest quality materials in the construction of the DreamCloud gives it a luxurious feel at a price that is closer to that of a non-luxury hybrid mattress with a much smaller thickness and cheaper, artificial materials. Sharing your bed – The individually wrapped coils are excellent at isolating and controlling motion, which makes the DreamCloud an ideal choice for couples with different sleeping habits. Mattress that sleeps cool – The DreamCloud does a good job of sleeping cool due to the gel infused foam top layer as well as the innerspring coil layer which by design provides good airflow and discourages heat retention. Mattress with a good support – The combination of the innerspring coil system and different foam layers in the top comfort layer provides an excellent degree of support suitable for sleepers of different weights and all sleeping positions. Sleeping on your back or stomach – The Leesa Hybrid (Sapira) mattress is more on the firmer side with 7 out of 10 on the firmness scale (10 being the firmest) which makes it ideal for back and stomach sleepers. The feeling of hug offered by memory foam – The soft exterior cover of this mattress combined with the multiple layers of foam does a good job at providing your body with a necessary hug, response, and contour without the feeling of being trapped in foam.